Big Red Car here. Ahh, did you get outside yesterday? Perfect temperature and a Mediterranean quality to the sky and light. AWESOME! On Earth as it is in ATX. Speaking of the ATX, did you know it was founded on 11 November 1839? Well it was. Did you also know that the Virginia Military Institute in Lexington, Virginia — The Boss’s alma mater — was also founded on 11 November 1839. About 1200 miles apart on the same day, two of the most influential and beloved institutions in the United States were founded. Wow! 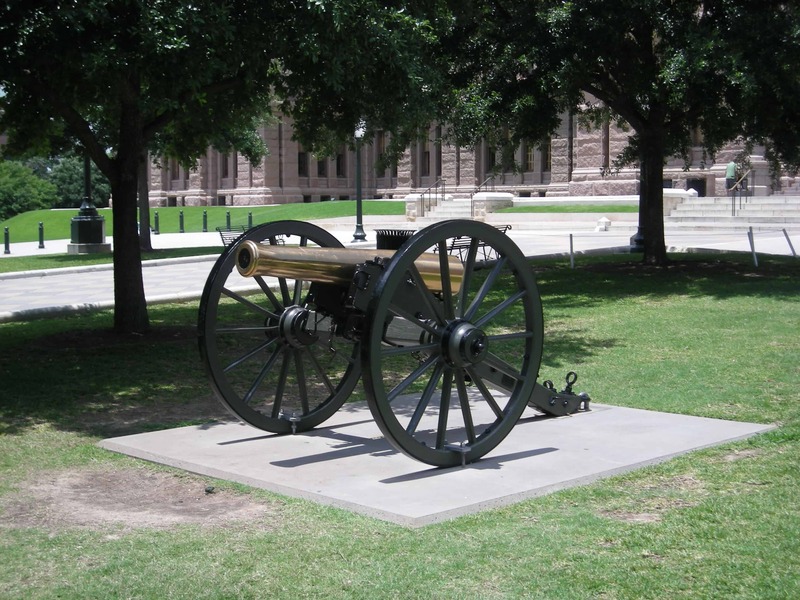 Here is a nice brass cannon at the Texas State Capitol in Austin. The Capitol stands at the head of Congress Avenue. 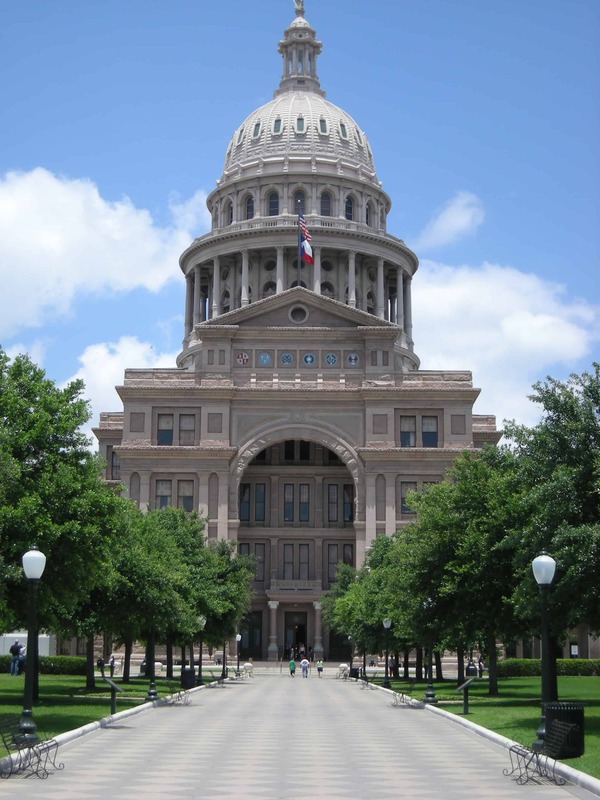 It is the largest State Capitol in the US and is bigger than the US Capitol. It was built during Reconstruction so it was always reputed to be smaller than the US Capitol but Texas fooled the Yankees and made it bigger. Austin is one of those great cities with a real spirit and character that makes it unique not only in Texas but in the whole United States — Hell, the whole damn world. The Boss just calls it home. The Virginia Military Institute has provided a lot of military leadership to the United States including 5-star General of the Armies George Catlett Marshall who ran World War II for the Americans and was described by Winston Churchill as the “Architect of Victory”. My favorite George Marshall story goes something like this — at the end of his career as professional soldier, Secretary of State, author of the Marshall Plan and other notable accomplishments he was sitting in the garden of his home and was approached by a man to write his memoirs with the promise of a $1MM advance — real money back in those days. Can you imagine anyone saying something even remotely like that today? Me neither. 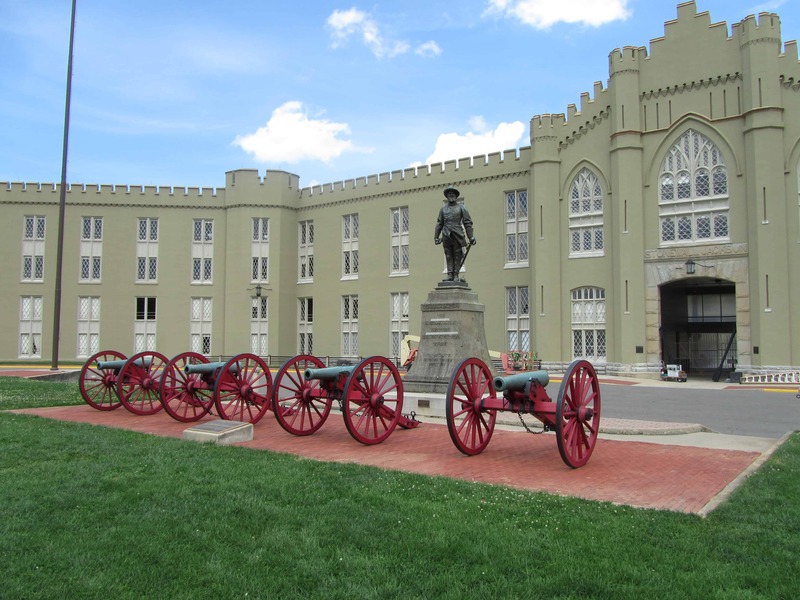 As you can see from this picture of VMI, they like cannons there also. Who doesn’t like a nice cannon battery? These ones were used by then Major Thomas “Stonewall” Jackson, a VMI professor of Natural Philosophy and Artillery Tactics to instruct the cadets. Built in 1848 these cannons went to war with the famed Rockbridge Artillery and were returned to VMI after the war. They were commanded by an Episcopal minister who named them Matthew, Mark, Luke and John. Above the arch in the background is a quote from Stonewall: “You may be whatever you resolve to be.” VMI cadets and grads have been inspired and guided by that sentiment since 1839. The Boss entered that arch as a clueless boy and emerged four years later with an engineering degree and the gumption to face the world. It is a transforming experience. VMI is a damn hard place to be but it’s a great place to be from. For the rest of one’s life, what others think to be difficult VMI men laugh at. They were forged in a pretty damn hot furnace. But, hey, what the Hell do I really know anyway? I’m just a Big Red Car. 11 November 1839, ya’ll — a damn good day in American history. This entry was posted in Austin, Virginia Military Institute and tagged 11 November 1839, Austin Texas, virginia military instiute, VMI. Bookmark the permalink.